On every piece of Blackhouse furniture and accessory you will find a very special label alongside our own. A simple grey piece of satin stitched with bright red and black thread bearing the iconic words ‘Harris Tweed’. And if you look even closer, you will spot ‘The Harris Tweed Authority’ Registered Trademark No.319214 and 100% Wool. So what’s the significance of this and why does it matter? Quite simply, these words and that special mark represent not only a little piece of Hebridean history but act as a guarantee for the authenticity of this iconic cloth. At the turn of the 20th century Harris Tweed was moving from a small cottage industry, to a national success story, to such an extent that unscrupulous merchants around the UK were desperately trying to jump on the Harris Tweed bandwagon by attempting to imitate the cloth and call it Harris Tweed too. However, their cloth was poorer in quality, usually woven by a machine and made far from the islands of Lewis and Harris. This lack of care and attention began to affect the reputation of the genuine article woven by the crofters of Lewis, Harris, Uists and Barra and threatened this vital source of income. A group of forward-thinking islanders took action and in 1910 formed The Harris Tweed Association. 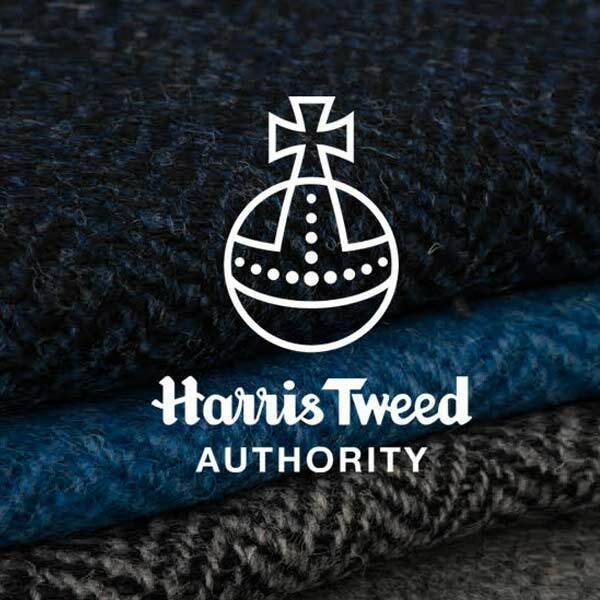 After much discussion they legally registered the name Harris Tweed and trademarked a new logo with the Board of Trade in London. Trademarking was not commonplace at that time but their shrewd move served to protect the name and production methods of genuine Harris Tweed cloth for the next 80 years, ensuring the islander craft was never again brought into disrepute. In 1993 the Houses of Parliament secured the name and trademark even further by passing the Harris Tweed Act, setting out the exact methods and conditions for making authentic Harris Tweed. The old Harris Tweed Association became The Harris Tweed Authority and was given new legal powers to tackle imitations and counterfeiting of the cloth in over 50 countries, preserving and enshrining the reputation of Harris Tweed in law for all of time. When you see the name and the Orb Mark now, you are assured of over 100 years of tradition and a cloth that has been hand-woven by the weavers of the Outer Hebrides, from 100% pure new wool, dyed and spun in these remote and ancient islands, making it more than just a label!